Friday February 21st 1902 I baked bread and got the dinner, and made me four aprons in the afternoon. Will went down to Woolfs. they are both sick. a nice day. Saturday February 22nd 1902 It was a nice day. We went down to Stevens to a dinner party. There was a pleasant company there and we had such a good time. came home in time to do the evening work, and knit all evening. Sunday February 23rd 1902 Will went down to Woolfs and found them some better. I was busy about the house till noon and read all the afternoon and evening. a warm day and the snow is nearly all gone. Mollie came back tonight. Monday February 24th 1902 I took some things out of the parlor besides doing the regular work. Will and I went to Mr Augustines funeral in the afternoon.he went on to town but I came back and took up the parlor carpet. 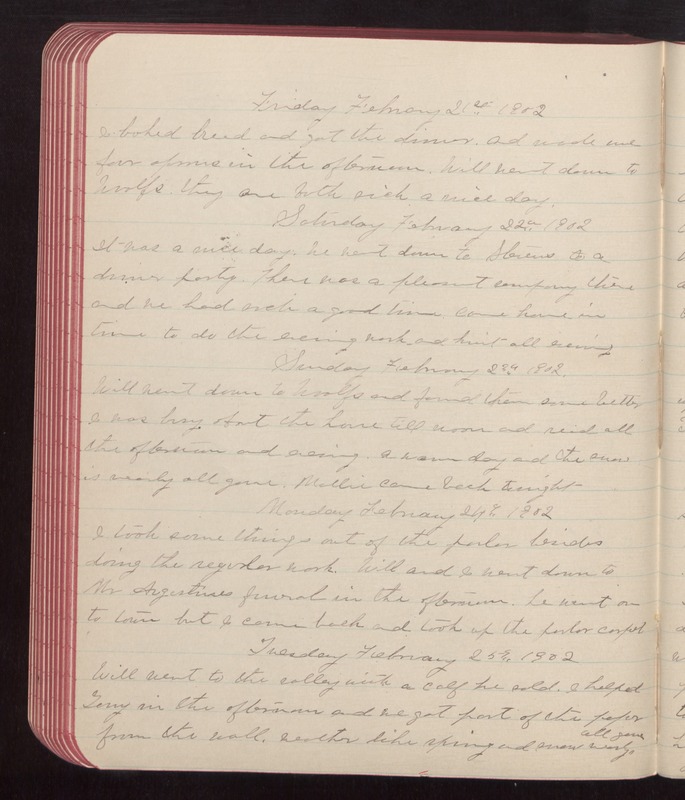 Tuesday February 25th 1902 Will went to the valley with a calf he sold. I helped Terry in the afternoon and we got part of the paper from the wall. weather like spring and snow nearly all gone.